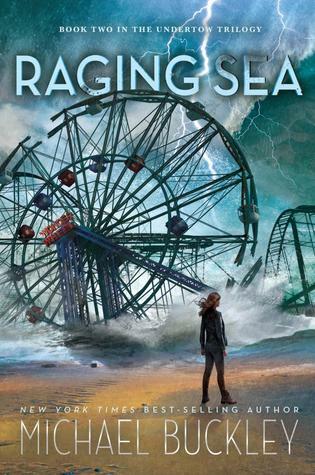 This weeks Waiting On Wednesday is Raging Sea by Michael Buckley! Okkayy, so, I might be fangirlling so hard right now that people are staring at me. A couple of days ago, my mother informed me I had two packages in the mail. Not one, but two! I was expecting the first one, but what I wasn’t expecting was for her to open the packages and tell me that this amazing beauty was in one of them. I read Undertow, the first book in the series, when I was first starting my blog last May – and let me tell you, boy do I freaken love that book. (My review is hyperlinked to the title…. read it!). I have to say, because of that cliffhanger at the end of book one, I have been desperately waiting to get my hands on book two – and now I finally have! *blows kisses to the beautiful people at HMH Kids*. I’m so excited to dive into this book (haha, see what I did there?). It’s back at home right now, but its going to be the first thing I devour when I come home on break.